configure: running /bin/sh ./configure '--prefix=/usr/local'  '--exec-prefix=/' --cache-file=/dev/null --srcdir=. NOTE:     of kernel module use the '--enable-kernel-module' option. test -z "/usr/local/include/fuse" || mkdir -p -- "/usr/local/include/fuse"
test -z "/usr/local/include/ntfs-3g" || /bin/mkdir -p "/usr/local/include/ntfs-3g"
A tablespace is easy to rebuild, so it is more cost-effective to rebuild it than back it up every day. A tablespace contains temporary or test data that you do not need to back up. A tablespace does not change often and therefore should be backed up on a different schedule from other backups. new RMAN configuration parameters are successfully stored. Step 3: Backup Database , We can check here Whether that tablespace Include or Exclude. Step 4: How do we take tablespace backup while configured exlcude option. Step 5: Disable Configure Exclude method. This Error may be occur, your db server not reachable for client machine Either Ipaddress wrong or ping or Firewall Blocked. Firewall : This is the case for me. So I looked my firewall settings of my local PC, The Firewall is OFF. But the Domain network firewall is ON. 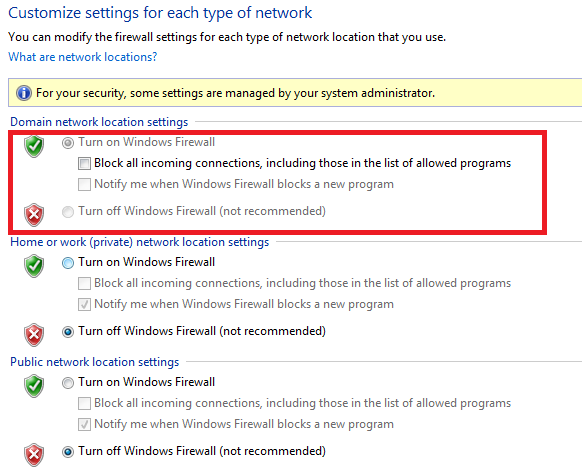 So I need to Switch OFF firewall for my domain network. But I cann’t without Network Administrator Advise. So I just decided , Atleast I want to Enable allow inbound connections, I just fixed and then I can easily connect my db from Appication Server. So I need to change or allow Inbound connections for Domain network. 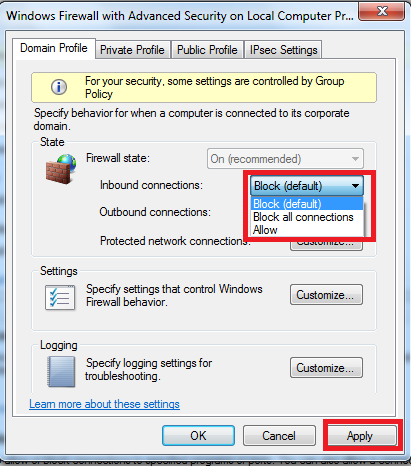 Click –> Windows Firewall Properties. Choose Inbound connections –> Allow and then Apply.Now I just try to connect my db from client, Its works fine.